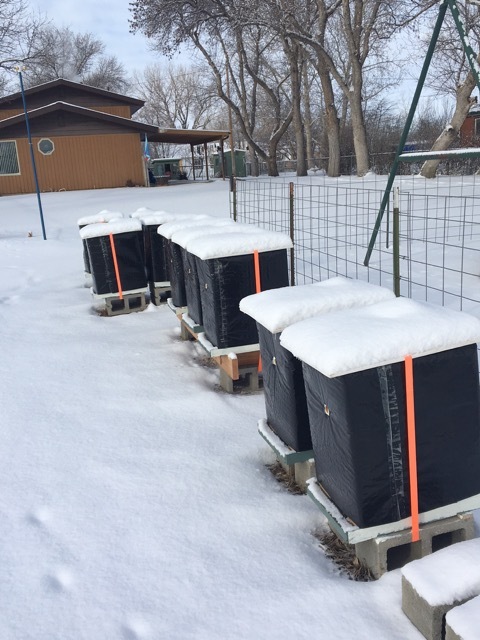 Bees go to bed when temp is below 50F. There are different types of going to bed but when it gets cold like this pic the bees cluster tight. A cluster is like a large ball of bees. All clustering around the queen to keep her warm. Remembering that there is only 1 queen per hive. This is their sole purpose in life. Bring in nectar, keep the queen happy and make more bees. As a beekeeper I try to get the hives through the winter. Feeding in November with some raw sugar. 10 lbs actually. And starting next month more sugar in the form of sugar cake. The black wrap helps to keep the cold wind out and on a sunny day provides some heat to the bees so that they might break cluster a bit and grab some honey and sugar for food. Anyway it will not be long and the flowers will be out and the bees will be busy. We need bees.